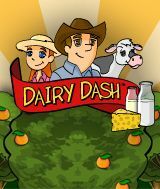 Download Dairy Dash for free at FreeRide Games! Ah, life on the farm... what could be more relaxing? Just about anything, according to the Smith family! Help these city slickers get a grip on the family farm as the entertaining hustle of the Diner Dash® series goes pastoral. Care for cows, goats, chickens, and sheep while growing tomatoes, corn and pumpkins. You'll even enjoy the occasional glass of lemonade and fill an order or two for Flo. It's all in a day's work in Dairy Dash® ! Players familiar with classic Diner Dash strategies like time management and event chaining will find that their hard-earned diner experience proves useful - as long as they remember that cows don't tip!